Washington: The US state of Arkansas is racing to execute eight death row inmates in 10 days next month to beat the expiration date on a hard-to-get drug used in lethal injections. Death penalty opponents have denounced the rush to execute, with the New York Times saying it was for a reason "as mundane as it is absurd." The eight men facing the ultimate punishment have been on death row for an average of two decades, but are now on a fast track to die. Under a decree signed by Arkansas Governor Asa Hutchinson, the first two prisoners will be put to death on April 17, followed by two more on April 20, another two on April 24 and the last pair on April 27. According to the Death Penalty Information Center, an independent organization, no state has ever carried out eight executions in 10 days. Since the US Supreme Court reinstated the death penalty in 1976, only Texas has put to death eight people in a single month. That was in 1977, the year executions resumed in the United States. Scheduling two executions on the same day is in itself "unusual," according to the DPIC. "States have executed two or three inmates on the same day just ten times in the last forty years, and no state has carried out more than one double execution in the same week," it said. Paradoxically, Arkansas has not executed anyone since 2005. 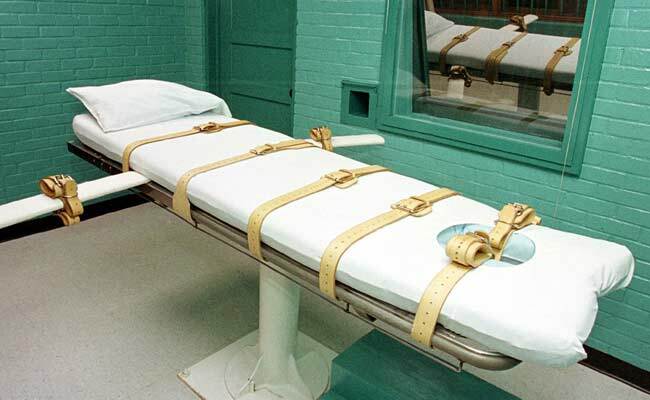 April's executions will reduce its population of death row inmates by a quarter. The drive to execute stems from the US Supreme Court's refusal last month to take up a challenge to the protocol Arkansas uses for lethal injections, effectively validating it. The protocol combines three drugs, beginning with midazolam, a controversial sedative that critics say is insufficiently powerful to assure that the condemned is unconscious during the execution, raising the risk he will experience severe pain. Although midazolam is legal, Arkansas's stocks are nearing their expiration date and it has become extremely difficult to replace them because big pharmaceutical companies refuse to provide the drug to US prisons. "I would love to have those extended over a period of multiple months and years, but that's not the circumstances that I find myself in," Hutchinson said. "It is uncertain as to whether another drug can be obtained, and the families of the victims do not need to live with continued uncertainty after decades of review," he said. Hutchinson is likely to find support among the state's conservative voters. The home state of Democratic former president Bill Clinton, it has veered solidly Republican in recent years. But the measure has set off waves of criticism far from the borders of the rural southern state. Hutchinson "is justifying a state-sanctioned killing spree driven by the use-by date stamped on a bottle," the New York Times editorialized, calling the decision "absurd." Kenneth Roth, executive director of Human Rights Watch, also denounced the "grotesque rush" to execute.